KATIE: Sheesh, Waffles. You sure don't know how to pack light, do you? WAFFLES: Um, Boss... a celebricat needs LOTS of cootie-mints. WAFFLES: That's what I said. Cootie Mints. KATIE: I guess Glogirly's lucky she managed to squeeze in a change of underwear. 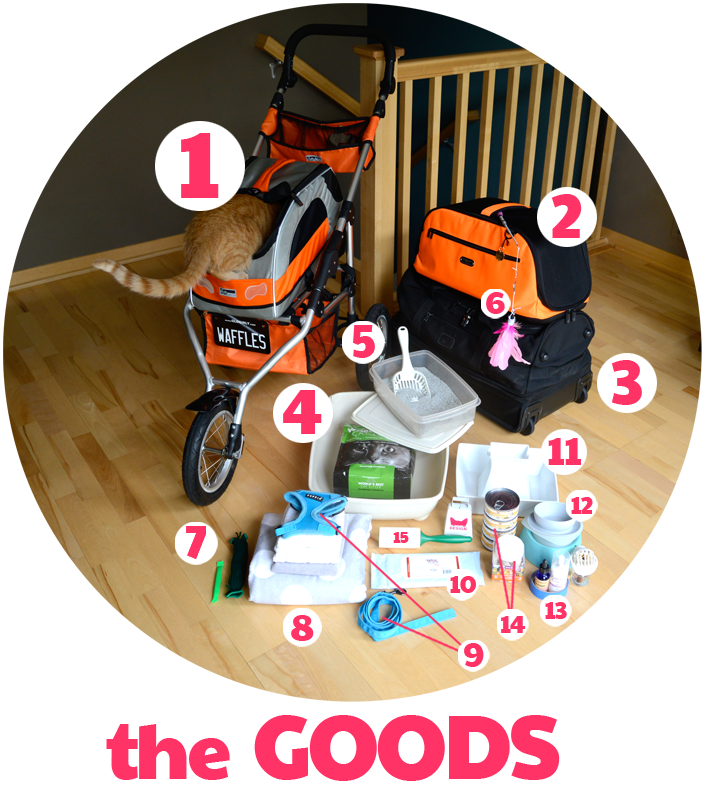 So in case anyone else is crazy enough to travel to Vegas with their cat, how about we tell everyone about all the stuff Glogirly schlepped around for you? Stroller with detachable carrier for public appearances. License plate optional but awesome. The Cadillac of carriers for air travel. Comfortable, stylish and oh-so-Waffles. For all my mancat supplies. No girly stuff allowed. Just like home, a kitty's got to feel comfortable getting down to business. A small plastic storage box with a lid, just in case of airport emergencies. Don't forget the scoop! Catnip Tickle Pickle, Nip Nibbler Fetch Toy and the elusive Red Dot. Blanket for the cold airplane floor & towels for potential messes. Not that I'd EVER make a mess. I never go out without them! Just in case of an accident. I never needed them, but Glogirly insisted we have them. Sounds fancy...but it took me a long time to use my litter box and Dr. Anna, one of the vets attending BlogPaws, recommended a fountain to make me *go. * It worked! Sleepypod's 3-piece dining set to eat and drink on the road in style. Feliway Comfort Zone diffuser and spray. Spirit Essenses Stress Stopper. These are absolute MUST HAVES. 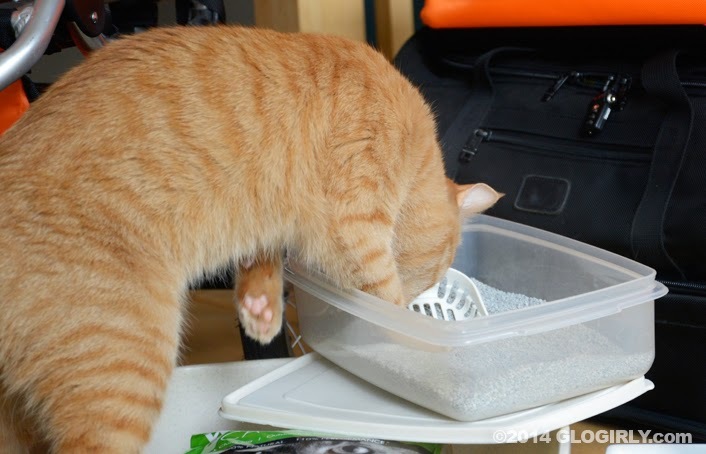 Be sure to eat the same food and treats you're already used to. New stuff is fun, but familiarity is important when the world around you looks so different. ...and be sure to leave enough room in your suitcase for the cool stuff you'll want to bring home. Meowm says she remembers traveling to her hometown with Junior one year. She had to pack tons of extra stuff too, but not as much as Glogirly...ans she was driving...so that helped. But we bet it was nice for Glogirly to have Waffles to snuggle with at night! We only travel around town with Molly Mew. I think you can add world traveler to your resume! 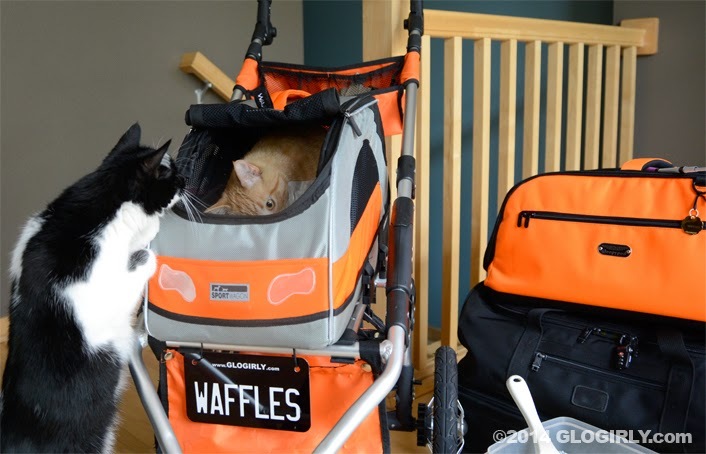 OMC Waffles, we don't know if there was ANY room left for Glogirly! That's a bunch of cootie-mints! This must mean you are a celebrity now. Right? There was hardly room in the room for the humans with all the WaffleWare. Waffles! You certainly do know how to travel in style! As the Limo driver for Miss Coco I can vouch for all this AND, the Devine Miss C has separate trunks for her 10 dresses, asundry hats and a special crush proof carrier for her wigs. I was amazed and honored. Thank Cod Ms Stella would never travel. Oi vey! Jeez, Waffles! Did anyone else get to bring any luggage on that plane, or did yours fill the entire cargo hold? I'm glad Glogirly realized YOUR needs were paramount! 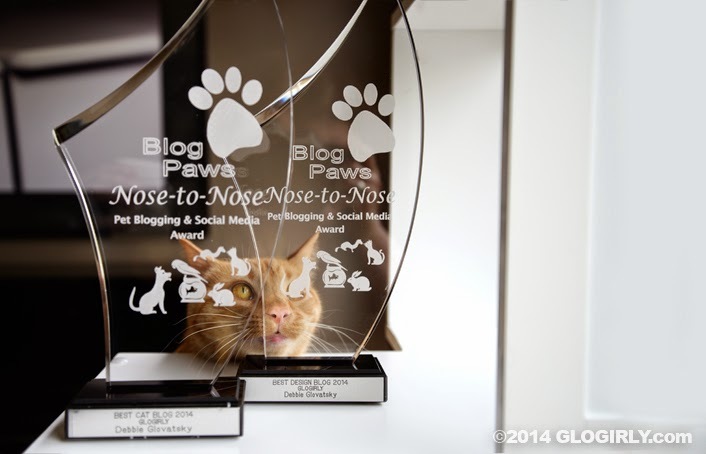 Who cares what she was wearing--I don't think any of the Blogpaws attendees looked at anyone but YOU anyway! And mega-congrats to Glogirly and Katie and You for the double awards! Even with all that cool stuff, I don't think you could get me to travel anywhere! I'll leave that to my human. That's way too much cooties for us. We don't think we're going to be traveling any time soon, but you did it like a champ. I'm happy to see that Stress Stopper was among the travel supplies. It's the best calming remedy I know of. That is absolutely the coolest cat traveler ever! Thanks for sharing. Amazed that your mom can fit all that in there! Glad you were one of the Stars! Wow, Waffles! How cool that you had you're own suitcase. You sure know how to travel. 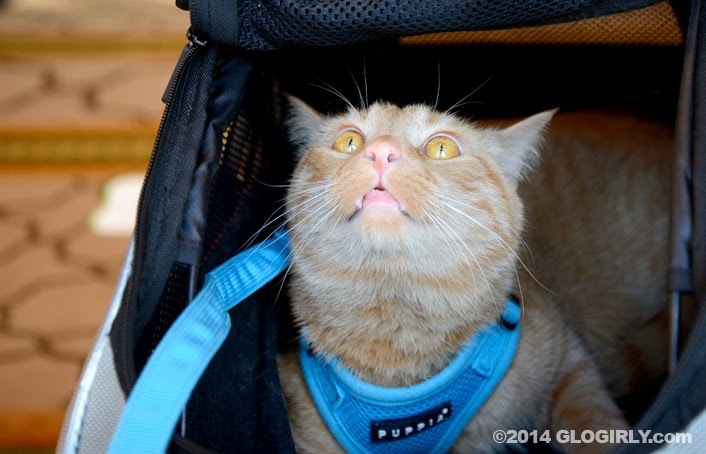 Eventhough we are dogs, we were fascinated with the list of supplies a cat would need at Blogpaws. I think we like the water fountain the best! Impressive pile of cootie-mints. Would Waffles want to travel again? Would Glogirly? Yep.....gotta have all the essentials. You sure pack well anyways! haha! I want a Waffles Wagon! It looks super cool, and I look pawesome in orange. It just needs to be an itty bit bigger to fit me. Meow Waffles you do travel in style. I wonder if GloGirly is just a wee bit tired after lugging you and your stuff around. WOW, just like traveling with a baby I guess. Waffles you are a lot of work for Glogirly, but oh so worth it. M would love to go next year to Nashville and is thinking about it. She'd love to meet you there if Glogirly could even possibly think of bringing you again. Do they sell "cootie mints" at Walmart Waffles?? You look so handsome posing with your awards!! Faraday: HEY! Lay off the Bro! Mouses that's a lot of stuff! Good thing there was some room left for YOU. Ah Glogirly, there's no "number" for Waffles. Maybe he could be #16. Can't be #1, that's Katie, right??? We HEARD about all your cootie mints, but it is much more impressive to actually SEE them! How ever did they have room on the plane for anyone else?? Wow Waffles you might need an assistant soon. Your pretty famous now. I ax for all that stuff when I have to go to the vet. MOL! Except the drining fountain. WOW Waffles! For a chap you certainly don't travel light!! You certainly don't pack light, do you, Waffles? But all of those things really are needed! Thanks for sharing this - Sophie will be going to BlogPaws with Mom next year, so she will need this list for when she packs! Impressive, very impressive Waffles! I like how you travel in style!! !